Have you started to notice new wrinkles and more brown spots on your face lately? Are you asking yourself, “How can I look better?” Are you prepared to take charge? Do you want to learn the secrets that keep women (and men) looking younger, longer? If you answered yes to any of these questions, then this is the book for you or anyone who wants to look their best at any age. Inside this book, you will find easy to understand, helpful tips on skin care, cosmetic treatments, sun protection, and beauty tips, just to name a few. 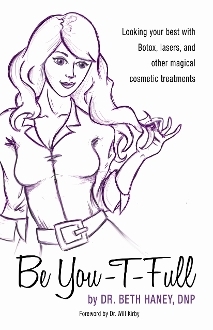 Understanding the pros and cons of confusing cosmetic treatments like Botox, Fillers and Lasers is easy with this informative and humorous book. Dr. Beth Haney will guide you through the maze of medical cosmetic treatments and empower you to make intelligent, informed decisions on evaluating your op- tions, and help you choose the correct solution. Start readIng and start turning back the clock!